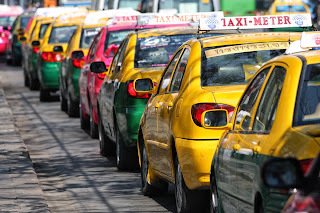 Estimated at around 200 000 taxi cars in Bangkok, there's never a shortage of taxis in a city that never sleeps, excepts when it starts raining of course. Taxis are cheap and available virtually 24 hours a day. Meter taxis now predominate, but sometimes you may have to politely (but firmly) ask them to switch the meter on to save negotiating later. Since taxis are cheap and the drivers work all hours in traffic that is legendary, a small tip is often appreciated.